Picture taken with my Republic Wireless Moto X. Meet Ragnarok. He’s been a part of our family longer than our children. On one of our first dates we went to the zoo and picked him up as an impulse buy. He’s served as an over-priced decoration and pillow in our household for many years, absorbing cuddles, temper tantrums, tears, and laughter. When we got him, the boyfriend now husband gave me two options as to what to name him. One of them was stupid. The other one was Ragnarok. Ragnarok is essentially to Norse mythology what the book of Revelations is to Christianity: a foretelling of our planet’s unavoidable doom. The world will end in upheaval at the whim of a myriad of natural disasters, annihilating not only mankind, but many of the gods. A few of those deities will survive, however, along with two human beings who will repopulate a pristine new world with new landmasses to replace the ones that have been decimated. The two people repopulating the world reminded me of the flood myth that permeates pretty much every culture ever. Which made me think of the Native American creation myth that varies from tribe to tribe, but pretty much always includes a turtle that the first human being rests on in the great blue sea. The turtle directs other sea animals to bring up dirt from the ocean floor to create land for the woman to walk and live on. In these stories, the land we walk on still rests on the back of that turtle. If the world were to be created anew again, why not have it happen the same way? Thus Ragnarok got his name. But good old Ragnarok’s been looking pretty rough lately. He was coming apart at the seams with stuffing spilling out of his stomach, neck, and fin. There were two reasons I wasn’t going to throw him away: first, I felt like my sewing skills could save this physical allegory of Planet Earth without having him end up in the dump, and second, I was not going to lose another turtle. So I sewed him up. My stitches were imperfect. My thread was about two shades too yellow to match his cream belly. But he lives on. Ready for more “pillow” fights and years of comforting. The myths and prophecies about our earth are coming true. Our earth will, most likely, end in a fitful death. A lot of that is our own fault. But I’m not ready to let the planet that my children will inhabit die quite that easily, either. I’m stitching her up. The stitches are imperfect and small, and it’s easy to feel like they’re not making a huge impact. But we’ve found a way to start recycling since I’ve read Madeleine’s book. I just cut up some old clothes bound for the trash so that we can use them as rags to replace paper towels. I’ve been cleaning with baking soda and vinegar instead of horrible chemicals for over a year now. I’m shopping consignment again rather than buying a bunch of cheap clothes new, which would force even more manufacturing and most likely a continuance of inhumane work conditions to fellow human beings in other countries. It turns out doing these things are also incredibly budget friendly. By reducing how much we use, we reduce how much we spend. By cleaning with homemade green products, we spend far less than if we were using commonly marketed chemical cleaners. When I shop consignment, I get better quality and quantity for my dollar. I’m not deluded. I know there’s no way those small things would add up to an end of global warming. 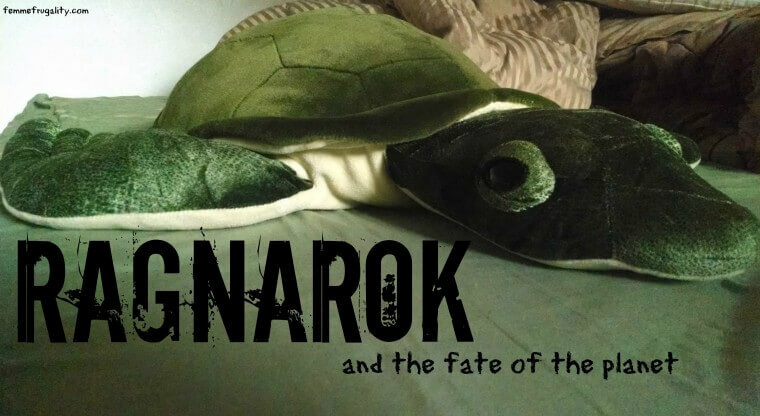 But maybe if we all sew together, even small amounts with imperfect stitches, we can delay the coming of the Norse’s Ragnarok, just as our family extended the life of our stuffed turtle. P.S. Check out my guest post today on Break the Sky! It’s a very introspective day today! This post is a part of Thrifty Tip Thursday at The Thrifty Issue. This entry was posted in Think on July 1, 2014 by femmefrugality. LOL. What a crazy name for your turtle. That’s awesome. Not every stuffed animal has such an epic backstory. I love that it seems like the more environmentally friendly you get, the thriftier everything is too. It’s just if your try to do it the frou-frou Whole Foods only way that it actually gets more expensive. Haha all of ours do! Mostly because my husband likes to make me laugh. I think you’ve hit something there… the only part I’ve found to be more costly is eating clean. You’re thinking locally! If everyone did what you did imagine how much the world would change. One Ragnarok at a time. I admit this is one of my more grandiose thought scaffolds. And that sewing up a stuffed turtle isn’t going to save the world. But the shift in thought process, if enough people submit themselves to it and act upon it, just might. Good on you! I know most people would just through it away and buy a new one, but that just adds to our Earth’s problem. We all need to get more into the habit of reusing instead of rebuying. Thanks! And absolutely. A lot of our stuff is made so cheaply I think we’ve forgotten the lost art of repairs.